HONG KONG — For eight years in a row, an international survey of nearly 300 cities has named Hong Kong the world’s least affordable housing market. It is not hard to see why. Located on a group of hilly islands and a corner of the Chinese mainland, Hong Kong has always been short of places to build. The government’s reliance on land sales for revenue creates an incentive to keep prices high. Money pouring in from mainland Chinese investors pushes them even higher. The extremes can be staggering. A single parking spot sold for $664,000 last year. Apartments only slightly bigger, and in much less desirable parts of town, go for more than $380,000. Living spaces have shrunk so much that a new term has emerged: “nano flat,” for apartments measuring around 200 square feet or less. Many Hong Kongers have been priced out of the housing market, including young people forced to live with their parents. Their discontent is said to have contributed to recent street protests like the 2014 Umbrella Movement. The architect James Law was at a construction site in town when he noticed some concrete pipes left over from an infrastructure project. They were large enough to walk in, cool in the summer and surprisingly nicely finished. “I had a eureka moment,” he said. 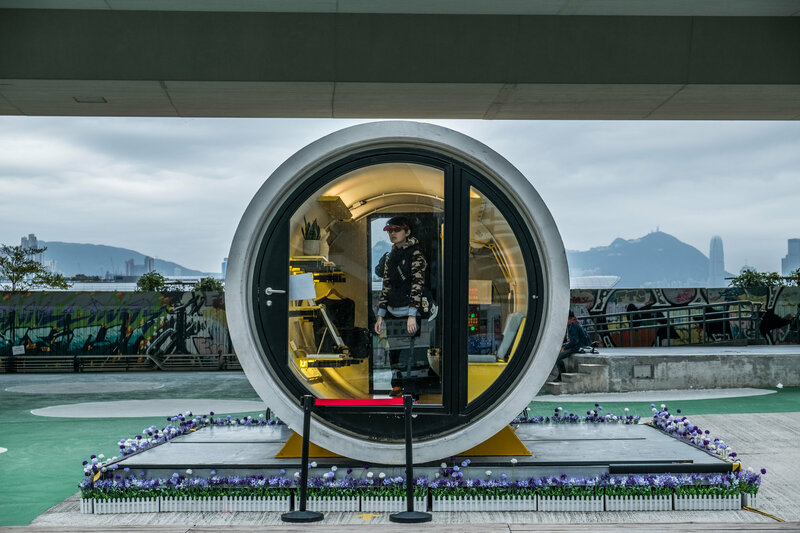 So he spent about a month designing and building the OPod, two sections of concrete drainpipe joined to create a living space of about 100 square feet. It includes a couch and foldout bed, a desk, shelving, a tiny kitchenette, a hanging closet and a shower. The pods can be stacked up to five high, or placed in small, unused spaces between buildings and under bridges. A prototype is now on display in a waterfront park, but there are no plans yet for commercial production. One idea is already a reality, in a pair of 50-year-old buildings with distinctive blue, gray and green geometric patterns. The buildings stand on a street lined with shops selling power tools and industrial fans. Such tenements, known as tong lau, were common here in Hong Kong before high-rises. Synergy Biz Group, a local architecture and development company, has recycled them into communal living spaces with some modern touches. Called Bibliotheque, the buildings feature slickly designed dormitory-like living spaces with shared kitchens and bathrooms. The rooms are tiny, with about 50 square feet per single unit, and cost from about $450 to $750 a month. The residents are mostly young, drawn by rents that are low by Hong Kong standards. Jo Chow, a 33-year-old office administrator who lives in one of the spaces, said she pays half of what she did for an apartment in a more distant corner of Hong Kong. 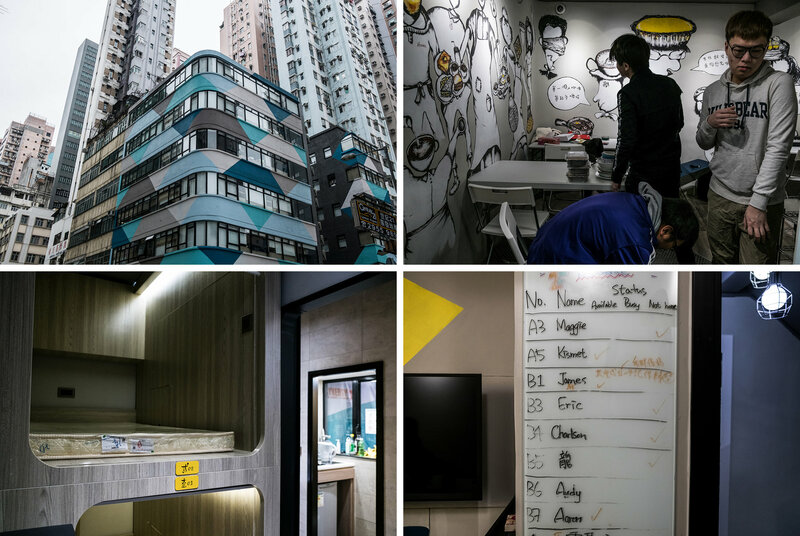 Some people have criticized these spaces as new takes on Hong Kong’s infamous “coffin homes,” apartments that have been subdivided into tiny spaces, and questioned the appeal of such cramped, communal arrangements. But Keith Wong, the director of Synergy, argued that group living provided security and a sense of community. He said the company wanted to add more buildings and to work with landlords to convert individual apartments. 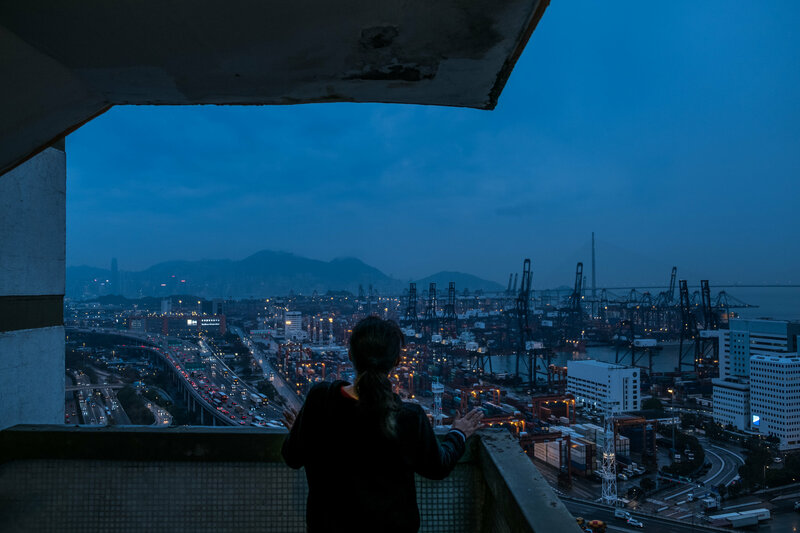 Half a century ago, when refugees poured into Hong Kong to escape turmoil in mainland China, the city started a public housing program that provides residences, usually in high-rises, for nearly half of the population today. The architect and professor David Erdman has suggested fitting in more people in those same buildings by going even higher, adding cornices of from 5 to 25 stories atop the existing structures, which are already often about 40 stories tall already. The idea was inspired by discussions with former colleagues at the University of Hong Kong about fitting additional housing in the spaces between public housing blocks. Building upward instead would offer the same result without harming existing amenities, said Mr. Erdman, now chairman of Graduate Architecture and Urban Design at the Pratt Institute in Brooklyn. 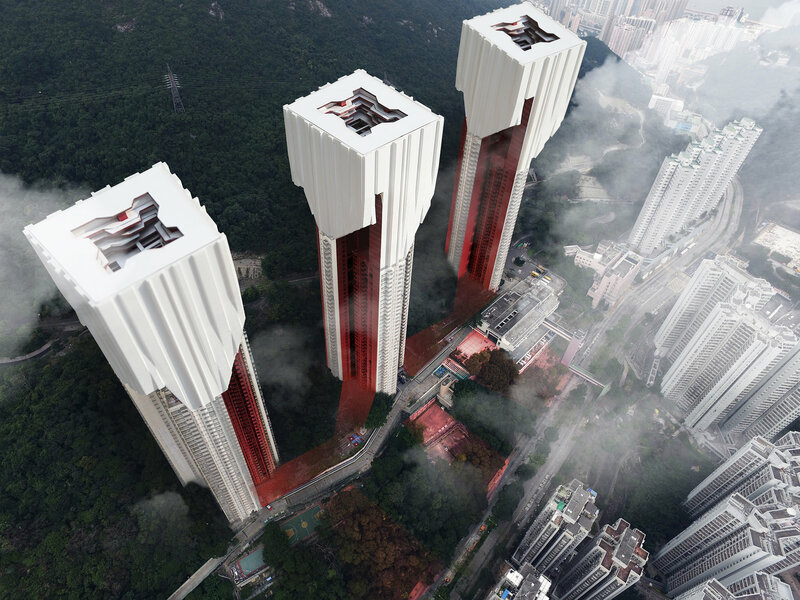 His students have produced dramatic designs that would transform the drab and repetitive look of Hong Kong’s public housing complexes. “I would love to see one built,” Mr. Erdman said. Perhaps the most unconventional idea calls for putting people on cruise liners. The floating community would not be a permanent solution but is instead the first step in a proposal from Doctoral Exchange, a local research group. 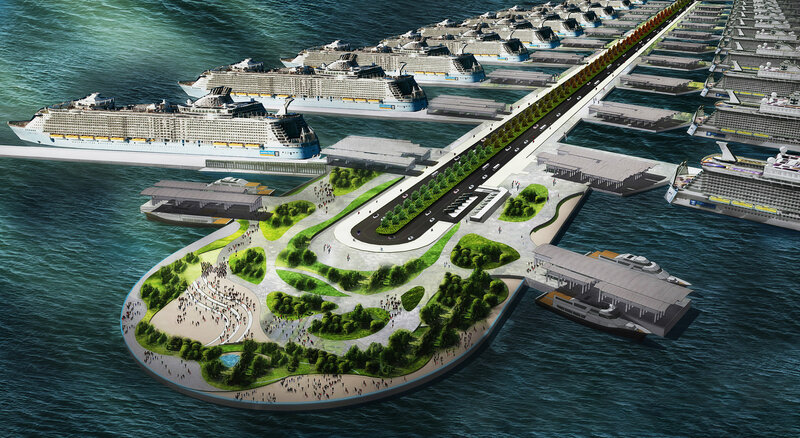 The second step of the plan is even more ambitious: building several large artificial islands in the sea to the south of Hong Kong. 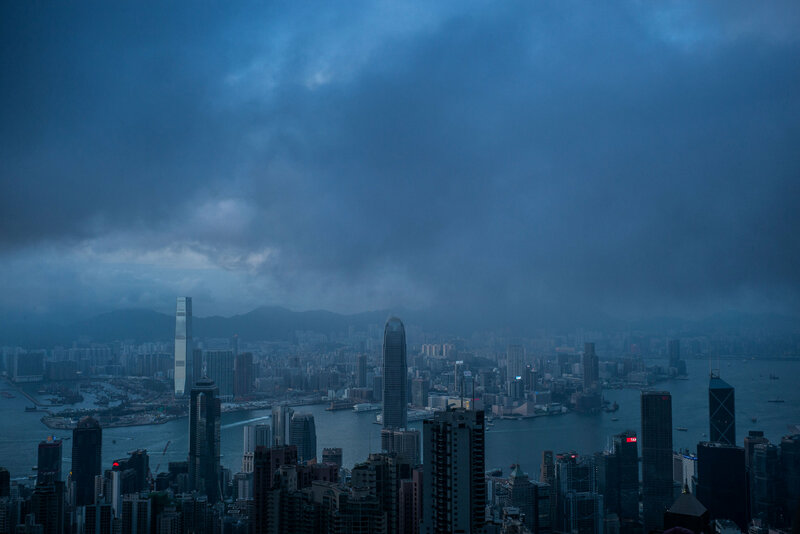 The new, 45-square-mile archipelago would fall outside Hong Kong’s boundaries, meaning it would require backing from China’s central government. Island building on such a scale would likely face opposition over potential environmental damage. But China would have at least one advantage in such a project, said Francis Neoton Cheung of Doctoral Exchange. It could use the same reclamation technology that it is currently developing in the South China Sea to build military strongholds on what were once sunken reefs, he said. Hong Kong’s container port is the world’s fifth-largest by volume. It also sits on an iconic part of the waterfront that the government task force is now looking at to ease the land shortage. Hundreds of thousands of people could live on the port’s 900 acres. One proposal calls for relocating the port to make way for housing. Another calls for keeping the port where it is, while constructing huge platforms above its bustling waterfront cranes on which residential skyscrapers could then be built. Officials call this idea feasible, and the port operator says it is open to the idea, but the cost and levels of public support are still unknown. Like other more ambitious ideas for new housing, the port-topping towers might never be built. But the idea of redeveloping ports isn’t so unusual. One of Hong Kong’s first large-scale private housing developments, Taikoo Shing, was built on the site of Swire Company’s dockyards.